initially used predominantly on commercial Carp watersthis bait was in a different class and has helped countless good anglers become great anglers, increasing catch rate and the size of fish being caught. We could list the flavours that these come in but that would take all day, suffice it to say that if you can think of a flavour then there'll be a bag available just for you, here are just a few; Strawberry, Pineapple, Halibut, Chocolate, Green lipped Mussell and so on. The main reason they are so favoured by both fish and fisherman is the fact that they are so easy to use and have such a strong scent and flavour. 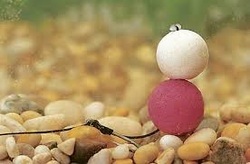 In more recent years the fishing scene has seen an increase in the use of this bait to catch all other coarse fish with more and more record fish falling to what were Carping methods. In particular large Bream, Tench, Chub and Barbel all seem to have a weakness for a boilie, especially with the introduction of the method feeder and the spod.